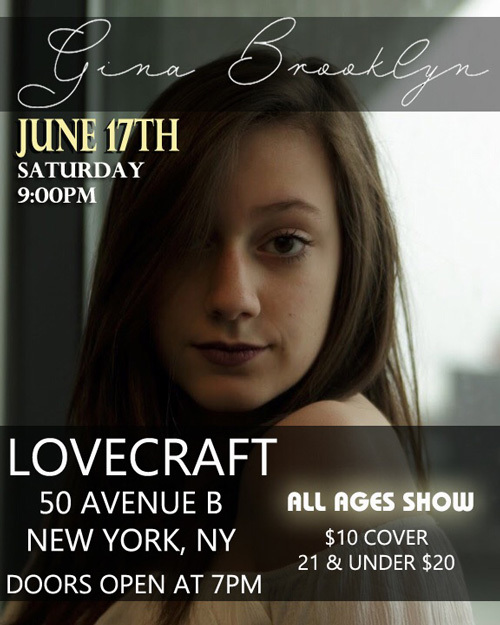 Pianist, singer, and songwriter GINA BROOKLYN will be playing at Lovecraft in NYC on June 17th at 9pm – 50 Ave B NY, NY. Gina Brooklyn develops a unique blend of traditional pop that combines hauntingly beautiful melodies and a distinct vocal style that seems to draw the listener into her seascape of thought provoking lyrics. Gina is currently working with a multi-platinum producer and developer who discovered her back in 2016 from a few demo recordings he heard online. MORE ABOUT GINA BROOKLYN: A precocious talent, Gina recorded at the infamous Studio City Studios in LA, 515 studios in Nashville, and Lava Room Recording Studios, in Cleveland, OH, when she was just 16. At only 14 years old she had already recorded at Omnisound and in Nashville, TN as well as Threshold Recording Studios in NYC. Gina who has performed at many venues throughout the United States including The BlueBird Cafe in Nashville and The Rock and Roll Hall of Fame in Cleveland, recently signed with Snow Entertainment. Snow Entertainment represents aspiring as well as established talent in the entertainment industry, and was founded by Cinda Snow, mother of television and film actress Brittany Snow. Hicham Chahidi: “Hello” – A Celebration of Rhythmic and Melodic Afro-Cuban Jazz!